A J.D. Davis three-run home run in the second inning that gave Houston a 3-0 lead was all Justin Verlander needed on Monday afternoon at The Stadium. Verlander went 6 2/3 innings, allowing just one run on five hits and no walks, with five strikeouts, to improve to 7-2 with a superb 1.11 ERA. The Yankees' lone run came when Greg Bird homered off Verlander in the seventh. The Red Sox put up 11 runs in the third inning in this one, started by a Nomar Garciaparra two-run double. A Darren Bragg RBI single that made it 6-0 knocked out Yankee starter Andy Pettitte, and with Darrren Holmes on in relief, Jason Varitek got a two-run double, followed by an RBI single for Garciaparra and a two-run single for Mo Vaughn to make it 11-0. The Yankees got a run back in the fourth, followed by a Joe Girardi three-run homer off Boston starter Pedro Martinez in the sixth, and three more in and seventh to pull within 11-7. In the ninth, Boston's Darren Lewis got a two-run single off Todd Erdos to make it 13-7 and put the game away. Martinez went 5 2./3 innings, allowing four runs on eight hits and two walks, with six strikeouts, to improve to 6-1 with a 2.63 ERA. Pettitte went just 2 2/3 innings, allowing eight runs on six hits and two walks, with four K's, to drop to 6-5 with a 4.88 ERA. 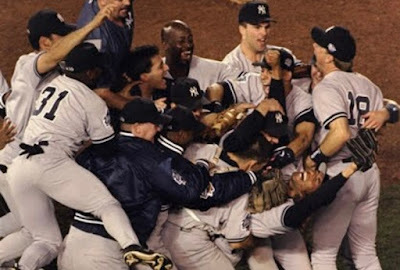 Where they stand: The 2018 Yankees (33-17) remain four games off the pace of the 1998 team, who were 37-13 through 50 games.